My brain is totally full right now. Last Sunday morning I awoke and, sitting out on the porch listening to the birds do their morning things, two ideas for books came to me suddenly, in a massive spontaneous BAM of Muse visit and my brain has been totally full ever since. I’d been waiting for that to happen for months, pondering and pontificating, and now I’m all excited. So I’ve got some epic projects to wend my way through, and I am stunned by it all. That being said, I need to kick my heels up this evening and simply share some photos and tell stories about them, just to break the epic spell of paralysis that Suddenly Having Grand Ideas can have on a person – a.k.a. : Major Writer’s Block! 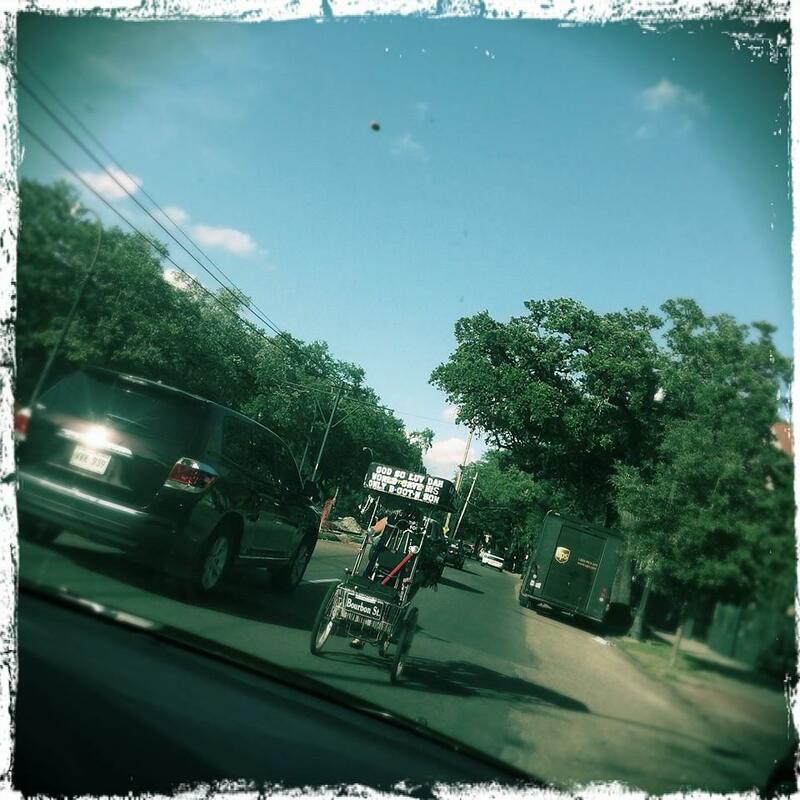 It’s been a while since I’ve shared my On the Way Home sightings, so we’re due for some chit-chat about my ramblings and roamings. As I shared last time, the streetcar line construction had me walking a lot. The bus was unreliable so I would walk down to Erato where the streetcar picked back up – and in the evening, when time wasn’t nearly as much of a factor, it was Good Therapy to amble home, and skipping the sardine-on-a-bus experience made that therapy even better. I was delighted to discover, last Sunday, that the line is back in full function (for the first time since we moved here), so it’s back to normal for me: roll to work, roll home. No need to walk unless I simply choose to. Since we’re now in the armpit of August summer, it’s nice to have that option. Meandering will further ensue once Fall decides to grace us with his presence. It was enjoyable to get to know a huge span of the area of the City in which I live. Enjoyable too, to See Things and get ’em. Like the Green Goat. I love the Green Goat. This house is situated on a sharp bend in the street, so I truly didn’t see it coming until I was right up on it. I squealed with glee and snapped a shot. Chained to the porch of a fancy house on Coliseum, this Technicolor king of the ‘hood became a daily morning greeting for me. 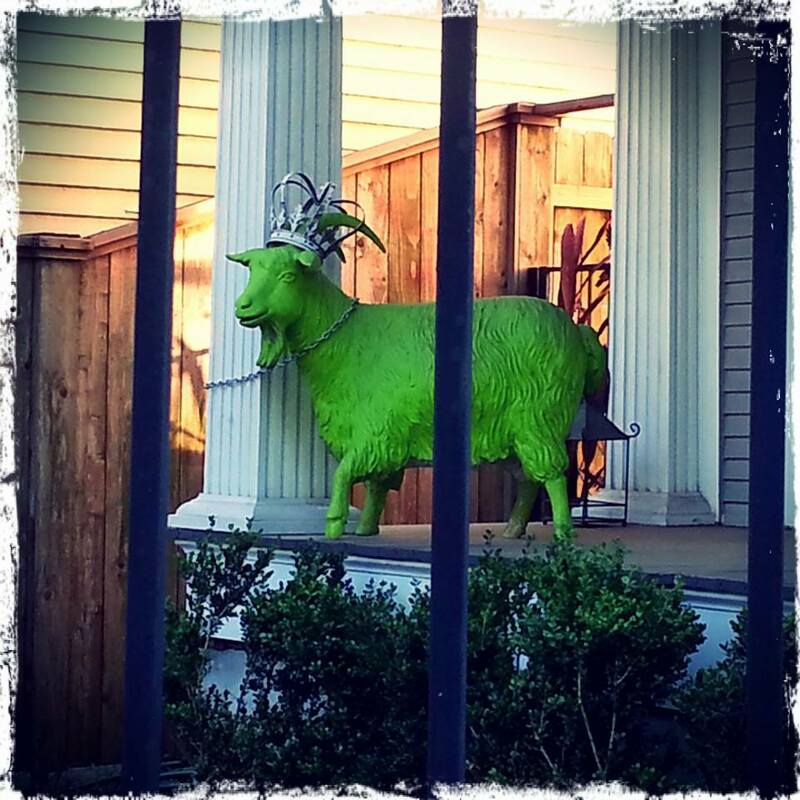 HI, GREEN GOAT! I imagine him busting out of his confines in the dead of night to romp mirthfully in the park across the street. Meanwhile, a little bit down the same road, is the Green Gate. 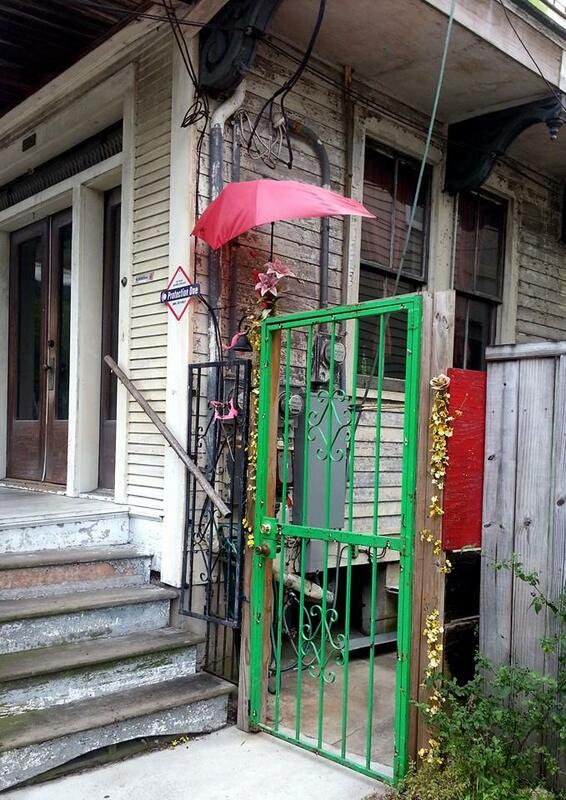 There was something quintessentially New Orleans about this Green Gate and its Red Umbrella. Like, if it were raining, you could smoosh yourself up against it and take some temporary shelter. Recently, I walked by there and the umbrella and its accoutrement are all gone. Did the Red Umbrella people move out? Seems like it. But the Green Gate is still there. It’s astonishing how quickly things can change around here, once you become used to something. This happens to me often: I’ll turn a corner and BAM I’m no longer in my decade, or my own era. 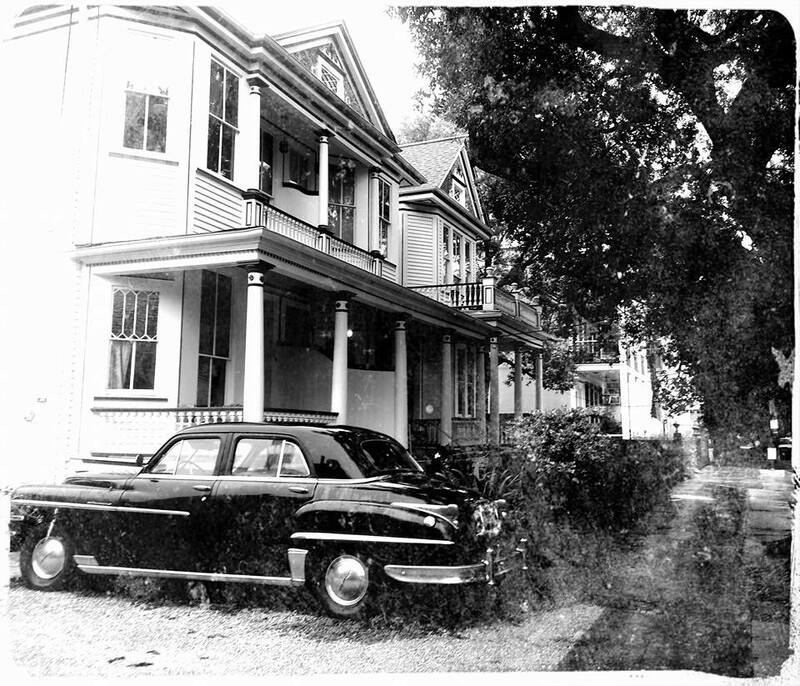 My first experience with time travel was on Prytania, at Josephine. I’d been admiring this vehicle for some time, and finally took a shot at capturing it. It wasn’t until I got home, and started a little editing, that I noticed the truck, as well. And looking deeper in, realized that you just cant really peg this image as having been taken very recently, at all. There are some minor details, sure, but nothing that really jumps out and screams 2014. That’s the glory of this City. 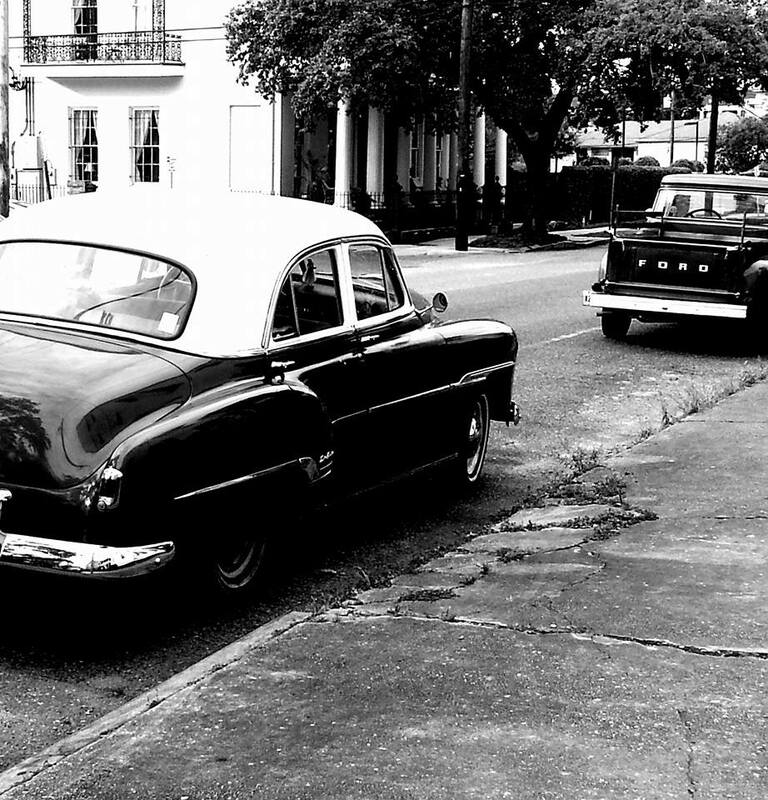 You never really know what decade you’ll walk into when you turn a corner. It happened to me again, not too long ago. Again, on Prytania. I can feel the veil of time, every time I step through it. That happens a lot, to me, here. I have a whole family of cats around here. The ones on my street, I know by name, for the most part. In the expanded reaches of my neighborhood roaming, I got to know many, many more. I greet them every morning. 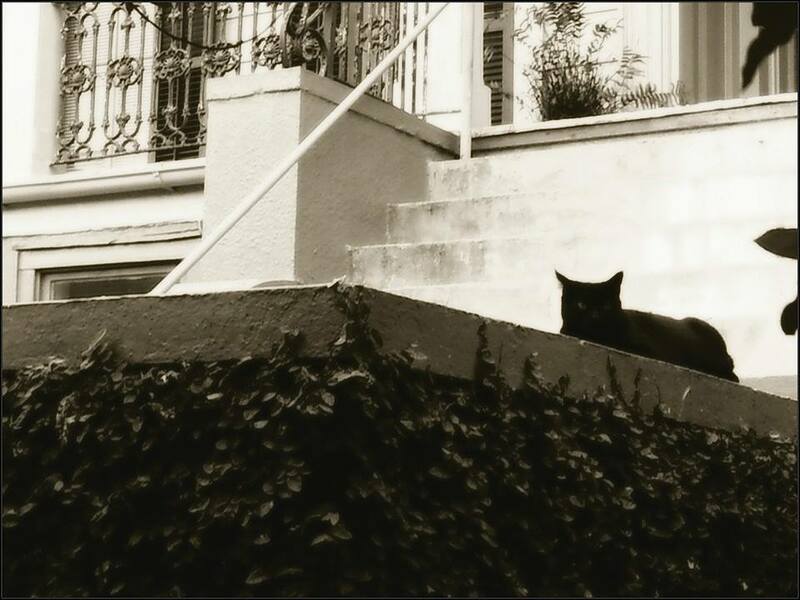 New Orleans has a wild crazy stray cat issue, no joke. But, for a girl who is allergic to cats, and cannot have one herself, it is kind of fun to really have All the Cats in the World. One afternoon, J picked me up from work so I could drop something off at the Boss’ house, Way Uptown. On the way back, we ended up in traffic behind Rolling Gospel herself!! I love running into my Characters, and finally finding myself in a position to snap an image of one turned a long day into a fun one. This gal gets around. Downtown. CBD. I inhabit that area so fully because of work, that I haven’t captured many images there recently. However, some work days are just long and draining enough that the only cure is to bust my creative eye out the moment I walk out those doors. One day, recently, it was just barely Not Too Hot to walk up to a streetcar stop that I very rarely use. I just felt like walking off the day, and finally stopped at a stop closer to Lee’s Circle. I immediately dubbed this the Ex-Phonebooth. 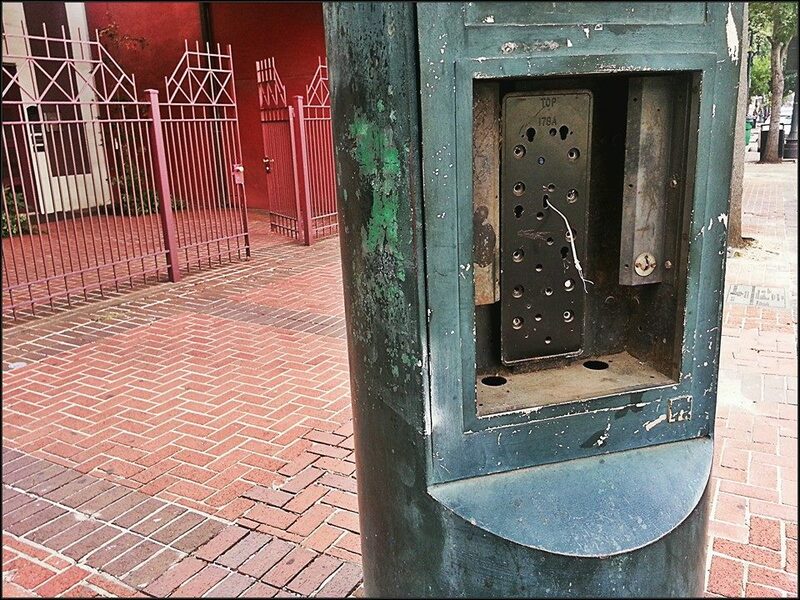 You just never see phonebooths anymore, and the ones you do see are often like this one…stripped of its functionality and destined to be a bastion tomb of the days of yore, forever. Not too long after that, when J and I were heading home from the latest Pussyfooter shindig, we paused at another stop to catch a streetcar home. I did a doubletake and momentarily believed I was falling absolutely out of my mind. So similar, like one corner layered on top of another one. I caught myself thinking, “Holy crap, did they suddenly put a phone in here? !” before understanding a split-second later that we were a block away from the Ex-Phone, on a corner with an identical shelter. 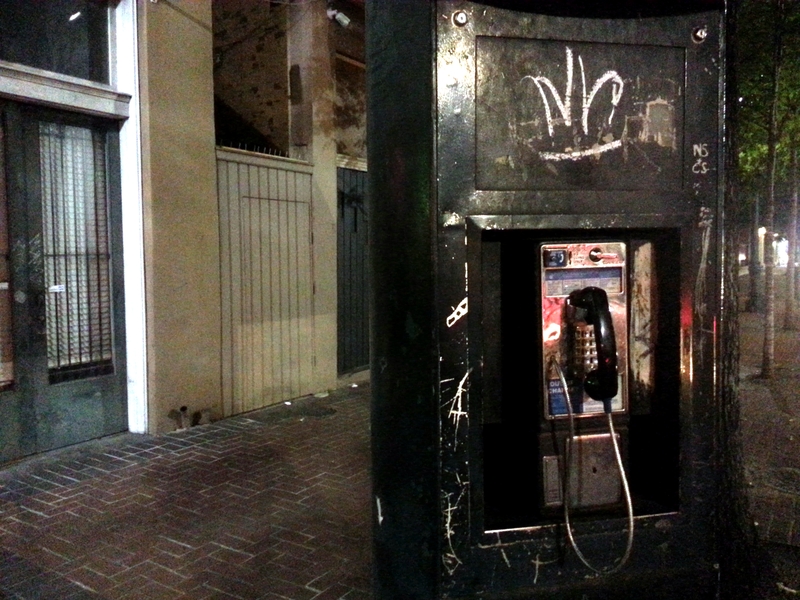 One block, and you’re suddenly back in the land of payphones. Kingly ones, too, per the graffiti. I was leaning on the windowsill of the Hibernia Bank at St. Charles and Union when, “SPLAT!” a Random Eggshell landed at my feet. Being a little defensive, I immediately wondered who threw the durn thing at me, but realized that this was no Off-the-Shelf makin’-groceries sort of egg. It was smaller than a usual chicken egg, and WAY more organic in appearance. Hibernia’s eaves and ledges up above are really very ideal pieces of downtown nesting real estate, and by golly, someone had just HATCHED. What made this even better was that it was Friday afternoon, and our first pre-season Saints homegame of the year. 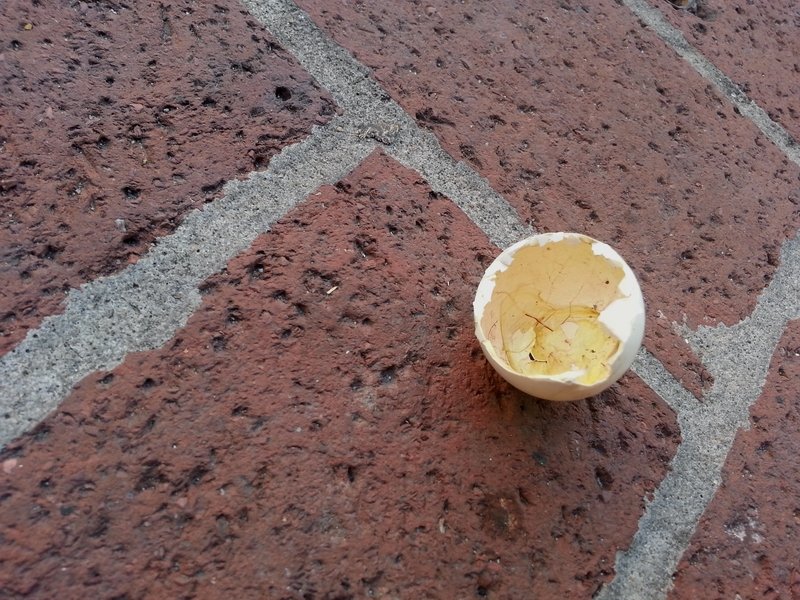 So everyone was out and about and smiling and happy and there I was bent over awkwardly in my game-colored office attire taking pictures of an eggshell on the sidewalk. When I stood up, I nearly head-butted a guy walking down the street and I looked at his quizzical expression and simply said, “Don’t Ask,” and he started just LAUGHING and so did I and it was an excellent way to start a weekend. Thank you, hatching birdy. This was today. I really like this one, and it’s what inspired me, rolling home, to sit down and share the latest batch of On the Way Home photos. I was up at the Common St. stop this afternoon, having walked to Brother’s to pull some cash and buy smokes to make some change so that I could feed it to the streetcar and get a change-card, which is so much easier than scrounging quarters all the time. It’s always more interesting, up at Common. I’ve said it before, but the closer you get to Canal St., the kookier things get. Sometimes it’s an uncomfortable kind of kooky, like the pudge-bellied 20-something lad who was completely off his rocker waving a dollar bill from the direction of his shorts (his only attire) at the streetcar I eventually boarded, hollering “WOOHOOO!!! !” to anyone that looked him in his hammered cross-eyes. Sometimes it’s random kooky, like the guy who got to the stop in the nick of time for our next car, who, because he recognized me as having shared a car with him before, looked up the street at the one he’d just missed and immediately and comfortably began to share with me the fact that he missed THAT car because he was too nice and cleaned up all the coffee grounds in his office kitchen that the switchboard gal forgot to handle before she ran away for the night. You nod and smile a lot around here. This one, though, was just a Moment. 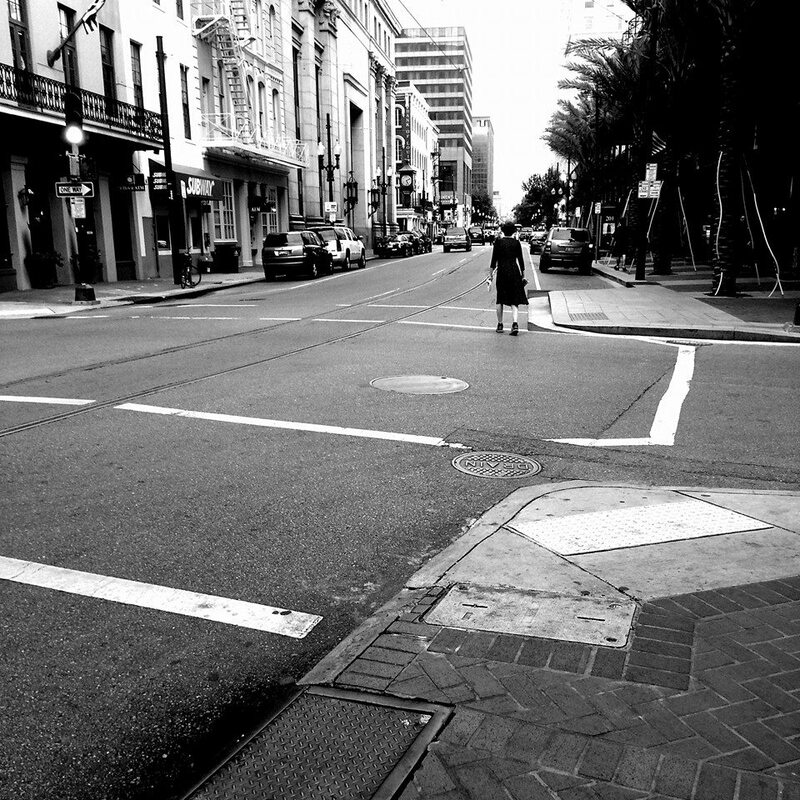 An old woman, shuffling down the street. Not the sidewalk, the street. She definitely knew where she was, and knew where she was going, and just shuffled right along. She had a dress I would kill for – it looks black here, but it was actually black with little bitty white polka dots. And I always love a gal in a hat. Oh City, My City. What a delightful stroll you took me on. Since I can’t stroll like I used to, these pictures and your keen sense in capturing and telling us about it, makes me feel like I was there. And, get onto writing some stories. Its the one thing I always wanted to do. I’m glad I can take you along on these strolls, this way! And yes indeed. It’s at the stage where these characters won’t leave me alone until I write them! These are the precious gems that make it your home, and such a wonderful place. I love seeing them! You know what this is? This is That Box full of treasures. You know The Box. You had one when you were a kid, I’m sure, and you probably still do. The Box contains special little bits and pieces of your life, things that wouldn’t mean anything at all to anyone else, but every now and again you sit with the box and run your fingers over the pieces and run the memories through your mind, and if the house ever caught fire, you’d grab the box before you ran. That’s what going through all the photos On the Way Home always feels like to me, and I love to see the city through your eyes because you really look and you don’t miss the real things. By the way, I LOVE the goat and the gate.